Until the mid-nineteenth century, Japanese philosophy was inextricably associated with religion, ethics, aesthetics, political organization and culture, and was not practiced as a distinct discipline in itself. Historically, Japan experienced periods of intense cultural and political exchange with the Korean peninsula and China, followed by long periods of isolation, during which foreign influences were assimilated and adapted to native culture. The major philosophical traditions which influenced Japan from abroad were Confucianism, Buddhism, Neo-Confucianism, Daoism and during the last two centuries, Western philosophy. While Western philosophy is closely related to conceptual components of language and logic, and generally involves an attempt to understand reality in terms of words, Eastern philosophy is more concerned with spiritual realization and self-development. Philosophical ideas are fused into religious or spiritual practices, literary traditions, and social cultural practices. Among Far Eastern traditions, while Chinese thought has generally had a practical orientation and Korean thought a religious tendency, Japanese thought developed according to a unique aesthetic sensitivity. The Japanese quest for refinement and perfection in cultural activities from culinary arts, carpentry, and technological works to fine arts and literature, is driven by a philosophical perspective which does not separate thought and action, the conceptual and the embodiment, and aesthetic perfection. Exposure to Western philosophy during the Meiji Restoration brought about a conflict between traditional Japanese thought and Western ideas. The effort to explain Eastern concepts in Western terminology has enriched both Western and Japanese thought. The historical development of Japanese philosophy has followed a pattern similar to the development of Japanese culture. Japan maintained the status of an isolated and independent nation until 1945, alternating periods of intense cultural and political exchange with the Korean peninsula and China, with long periods of relative isolation, during which foreign influences were assimilated and adapted to native culture. Those elements which could be successfully applied to a Japanese context were selectively strengthened and extended, while those that were not relevant were ignored or minimized. Until the introduction of Western philosophy in the nineteenth century, philosophy was not practiced in Japan as an end in itself, but was always closely related to practical matters such as government administration and social organization, ethics, or the internal development of the individual. The major philosophical traditions which influenced Japan from abroad were Confucianism, Buddhism, Neo-Confucianism and Western philosophy, and to a minor extent, Daoism. Confucian ideals are still evident today in the Japanese concept of society and the self, and in the organization of the government and the structure of society. Buddhism has profoundly impacted Japanese psychology, metaphysics, and aesthetics. Neo-Confucianism, which became prominent in the sixteenth century during the Tokugawa era, shaped Japanese ideas of virtue and social responsibility; and through its emphasis on investigating the principle or configuration of things, stimulated the Japanese study of the natural world. This trend was reinforced by an exposure to “Dutch science” and Western medicine during the sixteenth century. In the late nineteenth century, an urgent need to modernize Japan stimulated a deliberate study of Western philosophy and a conscious effort to relate Western concepts to Japanese thought. 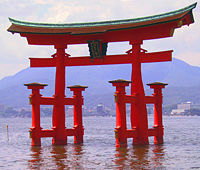 A torii at Itsukushima Shrine. Archaeological evidence and early historical accounts suggest that Japan was originally an animistic culture, which viewed the world as infused with kami or sacred presence. Kami was manifest in natural objects, animals, significant people such as rulers and shamans, personal deities, and guardian spirits; and sacred rites were performed to honor and appease them in order to ensure harmony in everyday events. The ancients understood humanity and nature to be parts of each other, not independently existing entities related as subject and object. The gods, the natural world and human beings were a natural continuum. This concept of spiritual immanence instead of transcendence has remained an underlying theme in the development of Japanese thought. It is thought that Confucianism arrived in Japan as early as the third century, but it was not until the seventh century, during the Yamato Period, that scholars took a philosophical interest in it, primarily as a standard for organizing society and government. In 604, Prince Shotoku distributed to his officials the Seventeen-Article Constitution, known as the first written law of Japan. It was a collection of written maxims, based on the Chinese model. Many of the moral commandments were derived from the Analects of Confucius and other Confucian works, but Buddhism was named as the supreme faith. After the fall of the Baekje Kingdom (660 C.E.) the Yamato government sent envoys directly to the Chinese court, from which they obtained a wealth of knowledge about philosophy and governmental structure. During the eleventh and twelfth centuries, the teachings of Zhu Xi transformed Confucianism in China, giving it a new rationalistic ontology. In 1603, when Tokugawa Ieyasu established the Tokugawa shogunate, he established an elaborate bureaucracy, modeled after the Chinese imperial system. Tokugawa was influenced by Fujiwara Seika (1561-1619), who believed that Neo-Confucianism was necessary to establish standards of conduct for business and trade. A student of Fujiwara Seika, Hayashi Razan (1583-1657), became advisor to the first three Tokugawa shoguns, opened a private academy which later became the State University (Daigaku-no-kami), and succeeded in establishing his family in a permanent post as Neo-Confucian advisors to the Tokugawa government. In 1630, with the support of the Tokugawas, Razan constructed a Confucian temple, the Sensei-den, in Ueno. Razan emphasized that the understanding of things can only be derived from an understanding of the principle (li) operating behind them, a concept which led to the development of an empirical scientific method in Japan and later hastened the assimilation of Western science during the Meiji period. Hayashi also initiated the writing of history as a means of legitimizing the existing social order, and his teachings led to the development of an ethical code of loyalty and obligation which enabled the Tokugawa regime to maintain control over more than two hundred autonomous territories. In 1790, the Tokugawa shogunate issued the Kansei Edict, making Neo-Confucianism the official philosophy of Japan and forbidding the teaching of "heterodox" studies. Other influential Neo-Confucians included Kumazawa Banzan (1619-1691) and Kaibara Ekken (1630-1714). Kumazawa Banzan was an adherent of "the school of mind," in which the human mind is seen as embodying the principle (li) of the universe. He applied this theory to political reform, advocating a political system based on merit rather than heredity, and the employment of political principles according to the individual situation. Kaibara Ekken introduced the systematic study of nature based on Neo-Confucianism, focusing on "natural law" (jori). He also worked to put Confucian philosophy into the language of the ordinary Japanese, in manuals of behavior such as Precepts for Children and Greater Learning for Women, and the translation of The Great Learning. During the eighteenth century, the systematic application of Neo-Confucian principles gave rise to humanistic sciences such as economics. Miura Baien (1723-1789), wrote Kagen ("The Origin of Price"), concluding that value is based on labor and materials, and claiming that labor and production are the principle meaningful human activities. Kaiho Seiryo (1755-1817), an itinerant wanderer from a warrior class family, developed the idea that government should regulate the production and distribution of goods, in order to prevent famine, overproduction, robbery, and strife. This single, unitary principle governed every natural and social event in the world. A single, unitary principle of nature, li, governed every natural and social event, and everything that occurred in society could be reduced to an economic transaction. Neo-Confucianism in Japan was challenged, as in China, by the idealistic Wang Yangming school, but also by philosophers such as Ogyu Sorai, Ito Jinsai, and Yamaga Soko, who believed that the samurai class was in trouble because the true principles of Confucianism had been misinterpreted, and advocated a return to the study of the ancient Confucian classics. The founders of the Kokugaku (National Studies) movement, instigated by the Buddhist monk Keichu (1640 - 1701), adopted this methodology and used it to reject Confucianism and all other Chinese influences. In a quest to rediscover the ancient glory of Japan, scholars such as Motoori Norinaga (1730 - 1801), Kamo no Mabuchi(1697 - 1769), and Kada no Azumamaro(1669 - 1736) studied ancient Japanese poetry and literature. At the end of the Edo age, a Kokugaku scholar, Hirata Atsutane (1776 - 1843), expanded his studies to include Dutch culture, Christianity, Hinduism, military strategy, Buddhism and many other topics, and brought about a revival of Shinto among the people of Japan, including the belief that there is an afterlife which is determined by a person’s conduct while on earth. The backlash against Neo-Confucianism was one of the factors that led to the end of the Tokugawa shogunate, providing inspiration and justification for those active in overthrowing the old order. During the modern period, Confucianism has often been identified with the Tokugawa era. A number of assumptions central to Confucianism continue to operate in modern Japanese popular and intellectual thought, as well as in Japanese ethics, though many people today do not possess an actual knowledge of Confucian philosophy. During the Heian period (794 – 1192), two major esoteric Buddhist sects developed: Shingon, founded by the monk Kukai (Kobo Daishi, 774 - 835), with close ties to Indian, Tibetan and Chinese thought; and the otherworldly Tendai, led by Saicho (767 - 822). During the Kamakura period (1185 -1333), political turmoil and instability combined with natural disasters caused the Japanese people to turn to Buddhism as a source of hope. Buddhism, which had been the province of scholars and the aristocracy, was popularized with the establishment of Pure Land Buddhism (Jodo Shu) by Honen (1133 -1212) and True Pure Land Buddhism (Jodo Shinshu) by Shinran (1173 – 1262), offering a simple method of salvation for common people. Nichiren Buddhism, founded by Nichiren (1222 – 1282), promoted the idea that salvation must concern itself with the actual world. Around 1199, the monk Eisai introduced Rinzai Zen Buddhism to the samurai class at the Kamakura court; it became the foundation for Bushido during the Tokugawa period. The Rinzai school used methods such as koans to achieve sudden enlightenment, and emphasized the use of practical techniques such as painting, music, martial arts, tea ceremony, and dancing as a means of spiritual self-cultivation. 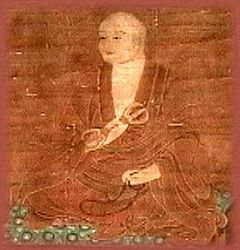 Dogen Zenji (1200- 1253), who established the Eiheiji Temple in 1244, and his successor Keizan (1268 – 1335) founded the Sōtō school of Zen, which stressed meditation as a means of eliminating consciousness of mind and body and achieving enlightenment. While the Rinzai school won the support of the military government, the popularity of the Sōtō school spread among the common people and provincial rulers, and it has the largest number of adherents in modern Japan. Dogen’s major work, Shobogenzo (Treasury of the Dharma Eye) is considered by many to be the best philosophical work written in the Japanese language, dealing with the philosophy of language, being and time. The goal of Buddhist philosophical thought was primarily religious fulfillment rather than the acquisition of knowledge, and it was usually accompanied by practice and ritual. Japanese Buddhist thought tended to minimize or dismiss the differences between Buddhism and other forms of Japanese religiosity, between the phenomenal world and any absolute realm, and between the means and end of enlightenment. Shinto and Confucian philosophy were often incorporated into Buddhist doctrines and practices. During the isolation of the Tokugawa period (1600-1868), Neo-Confucianism and Dutch science complemented Buddhist thought rather than being regarded as incompatible with it. After the opening of Japan to foreign influences, Buddhism tried to come to terms with early Indian Buddhism, Christianity and Western thought. .
Japanese Buddhism gave precedence to harmony, conformity and inclusiveness over political convenience, rigid adherence to principles, or practical consequences. Disputes were often settled by appealing to Buddhist sutras rather than resorting to the use of logic, because the sutras were believed to be a direct manifestation of reality. Logic was used to better understand Buddhist teachings rather than to acquire knowledge, and language was used for the expression and actualization of reality rather than to provide an organized framework for thought. Rituals, social practices, and artistic or literary expression were as essential to Japanese Buddhism as philosophical ideas. Over time, Buddhist thought developed themes such as the role of language in expressing truth; the non-dual nature of absolute and relative; the relationship between universal and particular; the significance of physical life; actualization of liberation in this world, life or body; equality of beings; and the transcendent non-duality of good and evil. Bushido is a code of values espoused by the samurai class during the Tokugawa era, when philosophers began to write about “the way of the warrior” (“bushido” is a modern term and was not used in pre-modern Japan). The Tokugawa bakufu was a military government, and in a quest to understand the meaning and proper role of the ruling warrior class during times of peace, philosophers developed the concept that warriors should educate themselves to be exemplars of Confucian values for all classes. The samurai adhered to Confucian principles defining the five moral relations between master and servant, father and son, husband and wife, older and younger brother, and friend and friend. They rejected many other Confucian teachings however, and believed that internal values should be actualized in everyday life, not developed through intellectual self-cultivation. From Shintoism, Bushido incorporated loyalty, patriotism, respect for ancestors, and a reverence for the Emperor as a divine being and for the land as the sacred dwelling place of the gods and the spirits of their forefathers. Buddhism taught the warrior not to fear death, since after death a person would be reincarnated and might return to earth in another life. The next life would be determined by the moral standards actualized in the present life; therefore dying with honor was preferable to living with shame. Zen taught self-control and the ability to focus the mind, particularly through the practice of disciplined physical activities such as marital arts and tea ceremony. The ideals of the warrior class included loyalty, courage, yearning for glory on the battlefield, an acute sense of honor and “face,” fear of shame, justice, benevolence, love, sincerity, honesty, and self-control. Samurai followed a specific code of etiquette in everyday life as well as in war, which specified even the clothing and accessories which could be worn. “Bushi no ichi-gon,” or "the word of a samurai," implied a pact of complete faithfulness and trust, requiring no written pledge or contract.. In ancient Japan, natural objects were thought to have been originally endowed with speech; though they later lost their voice, they did not necessarily lose their ability to express. Human beings, if they were sensitive to the natural world, could understand that expressiveness and convey it in thoughts, words and artifacts. In ancient Japanese, the term for this expressive possibility was kotodama, the ‘spirit’ (dama) of ‘word’ (koto) and/or ‘thing’ (also koto). The conveyance of this natural expressiveness became the underlying principle for Japanese aesthetics. Aesthetics did not become a subject of philosophy in Japan until the middle of the nineteenth century, when Japanese intellectuals and artists were exposed to Western thought. The principles of Japanese aesthetics, however, had already been in existence for centuries, and were closely related to Buddhism and Confucianism. Traditional Japanese philosophy understood basic reality as constant change, or impermanence. It did not recognize any stable entity or realm underlying the phenomena perceived by the physical senses. The arts in Japan have traditionally expressed or reflected on this fundamental impermanence, or mujô. Art itself has been regarded by Confucianism as the practice of self-cultivation, and by Buddhism as a means of spiritual development. Japanese scholars were often skilled in one or more of the arts of calligraphy, painting, music or poetry. Important concepts of Japanese aesthetics include mono no aware (the pathos of things), wabi (subdued, austere beauty), sabi (rustic patina), yûgen (mysterious profundity), and kire (cutting, the sudden ending of one movement or presentation in order to begin another). The arrival of Commodore Perry with a fleet of United States navy ships in 1853, to force the opening of Japan’s ports to foreign trade, was a signal to the Japanese that they were threatened by foreign encroachment and must quickly modernize and become a nation able to command respect as a global power. Scholars realized that this required not only an understanding of Western technology and science, but of Western thought and culture. In the 1870s, during the Meiji Restoration, the government instituted a program of “Civilization and Enlightenment” (bunmei kaika) to promote Western culture, clothing, architecture and intellectual trends. In the 1880s a renewed appreciation of traditional Japanese values tempered this trend, and resulted in an effort to synthesize Japanese values and Western culture, rather than blatantly and superficially imitating the West. Japanese intellectuals were sent to study abroad, and returned to introduce new concepts and ideas. Japanese thinkers especially struggled to grasp the Western concept of individualism. The Tokugawa shogunate had banned Christian missionaries from Japan for over a century, but without an understanding of Christianity, it was difficult for scholars to comprehend the Western concept of the individual. Nishida Kitaro (1870 – 1945) and his friend D.T. Suzuki (1870 – 1966) were both born immediately after the Meiji Restoration and grew up in the midst of the conflict between traditional Japanese values and new ideas from the West. Both were deeply interested in Zen Buddhism. Nishida incorporated ideas of both Western and thought and Zen in a unique philosophy, and worked to articulate the teachings of Zen in the terminology of Western philosophy. Central to his thought was the concept of “pure experience,” an embodied awakening which preceded articulation. Nishida found the “Kyoto school” of modern Japanese philosophers, centering around the University of Kyoto. D.T. Suzuki (1870 – 1966) published more than one hundred books which explicated esoteric Zen teachings and concepts for Western audiences, and presented Zen as a profound religious thought which attracted Western intellectuals and generated a lively following for Zen in the West. Suzuki deplored the deterioration of traditional spiritual values in Japan, warning that it would lead to dire consequences. 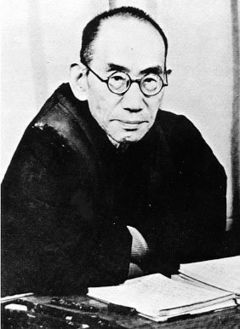 Watsuji Tetsuro (1889 – 1960), a member of the Kyoto school, studied in Germany and came to reject the individualism of Martin Heidegger and other European philosophers, positing in stead that the individual should be regarded, not as an isolated being, but as a relational existence (“aidagara”) between man and man, man and society, and man and nature. He explained human existence in terms of social and geographic phenomena, and suggested that an individual could only be understood in the context of his physical and intellectual surroundings. Along with the efforts of philosophers to synthesize Western individualism with traditional Japanese cultural values came new genres of literature, art and music in Japan. Writing became a vehicle for individual self-expression, rather than a means of sharing common sentiments and experiences in a stylized format. 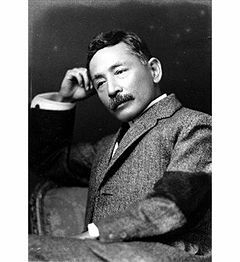 Writers like Natsume Soseki (夏目 漱石, 1867 – 1916) and Mori Ogai (森 鷗外; 森 鴎外; 1862 – 1922) who studied abroad and then returned to Japan, produced innovative works of autobiographical fiction. Traditionalists like Masaoka Shiki ( 正岡子規) reinvented ancient styles of poetry through the introduction of new subject matter and contemporary language. Some writers, like Mishima Yukio (三島由紀夫), and Ōoka Shōhei (大岡昇平), writing in a modern style, advocated a return to traditional Japanese values. In the visual arts and film, Japanese aesthetics had as much impact on the West as Western culture had on Japan. As early as the Edo age, the Western use of perspective in landscapes influenced Japanese painters and print makers. Their works in turn had a powerful influence on the development of Impressionism in Europe, and later on portraiture and print making. The beauty and simple sensuality of early Japanese black-and-white films, and their use of spiritual values as subject matter, introduced new concepts to Western film makers and contributed to the development of film as an art as well as a form of popular entertainment. ↑ Thomas P. Kasulis, (1998). "Japanese philosophy". In E. Craig (Ed. ), Routledge Encyclopedia of Philosophy. (London: Routledge.) Retrieved September 04, 2007. ↑ Kasulis, (1998). "Japanese philosophy". ↑ Peter Nosco. “Confucian Philosophy, Japanese” 2000. Concise Routledge encyclopedia of philosophy. (London: Routledge. ISBN 0415223644), 163-164. ↑ Kasulis, (1998). Japanese philosophy. Retrieved September 17, 2007. ↑ Kasulis, 1998. Japanese philosophy. Retrieved September 04, 2007. ↑ James Clark. Bushido. "The Way of the Warrior" Asian Studies Center at Pacific University. Retrieved September 17, 2007. ↑ Kasulis (1998). "Japanese philosophy." ↑ Thomas P. Kasulis, "Japanese Aesthetics", Stanford Encyclopedia of Philosophy. Retrieved September 17, 2007. East-West Philosophers' Conference, and Charles Alexander Moore. 1962. Philosophy and culture—East and West; East-West philosophy in practical perspective. Honolulu: University of Hawaii Press. Kasulis, Thomas P. 1998. "Japanese philosophy." In E. Craig (Ed. ), Routledge Encyclopedia of Philosophy. London: Routledge. Japanese philosophy, Routledge Encyclopedia of Philosophy. “Japanese Aesthetics,” Stanford Encyclopedia of Philosophy. This page was last modified on 24 March 2018, at 22:22.